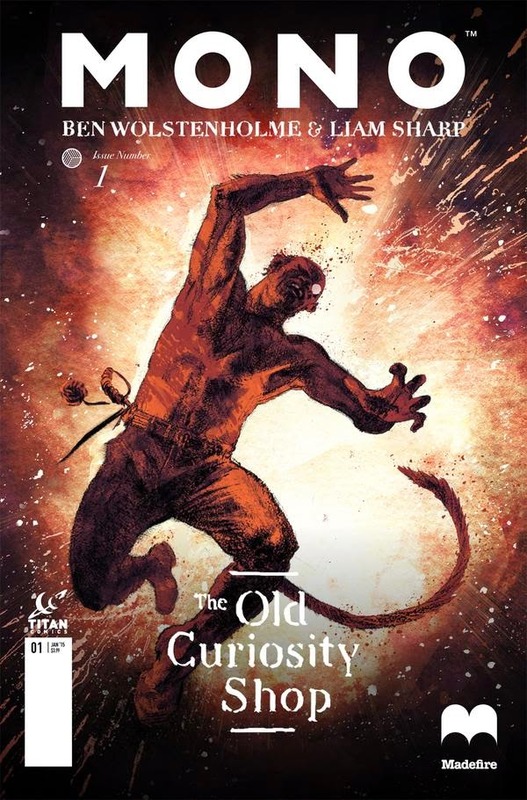 The Fellowship was fortunate enough to obtain a copy of MONO:THE OLD CURIOSITY SHOP #1 from Titan Comics. Liam Sharp writes, Ben Wolstenholme draws and Fin Cramb colors. Mono is a legendary British hero – the bestial warrior fighting for Queen and Country through the pulp era. The stories were written, but none of them captured the man behind the myth. Now his own journals have been discovered, and an old friend has decided to set the record straight. Who was the real Mono, and how much of the legend is real? Mono is described as half man, half ape, so beyond the pulp hero concept he’s also a scientific curiosity. Both of those factors pique my interest in this story. And the journal style of narration is nicely done, showing an unexpected side to the character. This book also contains possibly the most captivating art I’ve seen this year. The detail work in the closeups and in the larger landscapes is thoroughly amazing. This is a story about the line between truth and fiction, between fact and embellishment. It’s beautifully done so far, and I’m ready to see the rest. Check it out. MONO: THE OLD CURIOSITY SHOP #1 is available now at your FLCS or at titan-comics.com.